Some applications (for example, applications for consoles or that are installed on Smart TVs) are not able to get the authorization code from the URL. In this case, users must get the code from Yandex.OAuth and enter it in the application themselves. The application opens the Yandex.OAuth page in the browser, where the user can grant access to personal data. If the device where the application is installed doesn't have a browser, the user will have to go to the appropriate address on a computer. To make it easier to enter the address, provide a QR code or short link for the user. The user goes to the open page or short link and allows access for the application. 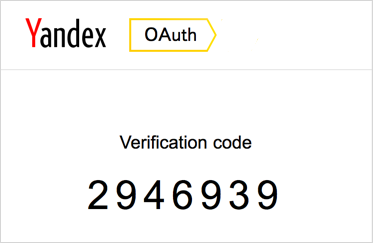 Yandex.OAuth displays the authorization code. (For this to happen, the Callback URL application parameter must indicate the address https://oauth.yandex.ru/verification_code). The application sends a POST request with the code. Yandex.OAuth returns a token in the message body. Tip. Debugging tokens can be obtained manually. When requesting an authorization code, specify the value “code”. Unique ID of the device that the token is being requested for. To ensure uniqueness, it is sufficient to generate the UUID once and use it for every request for a new token from this device. The ID must be at least 6 characters and no more than 50. Only printable ASCII symbols are allowed (codes 32 through 126). Restriction. An application can't have more than 20 tokens associated with devices for a specific user. If Yandex.OAuth successfully issues the application a new token for a device, the oldest token stops working. For more information about device tokens, see Device token. The device name to show to users. Maximum of 100 characters. For mobile devices, we recommend passing the device name set by the user. If it does not have a name, you can make one up using the device model, OS name and version, and so on. If the device_name parameter was passed without the device_id parameter, it will be ignored. Yandex.OAuth can only issue a regular token that is not associated with the device. If the device_id parameter was passed without the device_name parameter, the user interface will show the token as issued for an unknown device. Explicitly identifies the account that the token is being requested for. The parameter value can pass a Yandex account username, or an email address for Yandex.Mail or Yandex.Mail for Domain. If the user is already logged in under the necessary account, Yandex.OAuth just asks for permission to access data. If the user isn't logged in under the necessary account, the service displays the Yandex login page with this parameter value shown in the username field. Keep in mind that the token won't necessarily be requested for the account shown: the user might delete the pre-filled username and log in with another one. If the parameter specifies a non-existent account, Yandex.OAuth can only inform the user of this. The application will have to request the token over again. A space-separated list of permissions that the application needs at this time. The requested permissions must be from the list that was specified when registering the application. To find out which permissions are available, go to https://oauth.yandex.com/client/<client_id>/info (specify the application's ID in place of <client_id>). If the scope and optional_scope parameters were omitted from the request, the token is issued with the permissions that were specified when registering the application. This parameter lets you get a token for just the permissions that the application needs right now. Note. Access permissions that are requested using both the scope parameter and the optional_scope parameter simultaneously are treated as optional permissions that the application can do without. The user can decide which of the requested permissions to grant the application, and which ones to refuse. A list of space-separated optional access permissions that the application can function without. Optional permissions are requested in addition to the permissions specified in the scope parameter. Optional permissions must be from the list that was specified when registering the application. To find out which permissions are available, go to https://oauth.yandex.com/client/<client_id>/info (specify the application's ID in place of <client_id>). The user can decide which of the requested permissions to grant the application, and which ones to refuse. The token is issued with the permissions specified in the scope parameter and the permissions from the optional_scope parameter that the user selected. For example, you can use this parameter if the application requires the user's email address for registration, while access to the user's profile picture is preferable, but not required. Note. Access permissions that are requested using both the scope parameter and the optional_scope parameter simultaneously are treated as optional permissions. Indicates that the application must ask the user for permission to access the account (even if the user has already granted access for this application). When it gets this parameter, Yandex.OAuth asks the user to allow the application access and to select the desired Yandex account. This parameter is processed if the value is set to “yes”, “true”, or “1”. If any other value is set, the parameter is ignored. The state string, which Yandex.OAuth returns without making any changes. The maximum length of the string is 1024 characters. For example, you can use it for protection from CSRF attacks or for identifying the user that a token is requested for. When the user grants access to personal data, Yandex.OAuth outputs an authorization code. The lifespan of this code is 10 minutes. When it expires, a code must be requested again. The application sends the code, along with its ID and password, in a POST request. If you are using the authorization code, enter the value of “authorization_code”. The authorization code received from Yandex.OAuth. The lifespan of this code is 10 minutes. When it expires, a code must be requested again. The application ID and password must be passed either in the request parameters or in the Authorization header. The ID of the device that the token is being requested for. If the ID was set in the device_id parameter when requesting the authorization code, the device_id and device_name parameters are ignored when requesting the token. The name of the device that the token is being requested for. If the device_id parameter was passed when requesting the authorization code, the device_name and device_id parameters are ignored when requesting a token. The lifespan of a refresh token is the same as the OAuth token's lifespan. bad_verification_code — The passed value of the code parameter is not a 7-digit number. invalid_grant ― Invalid or expired authorization code. invalid_scope — The application's permissions changed after the authorization code was generated.